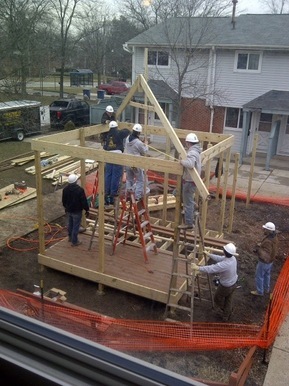 Posted on Mon, May 6, 2013 : 5:59 a.m.
To onlookers, the structure built by Eastern Michigan University students throughout March and April appears pretty straightforward: It's a gazebo. But for the 85 residents of Green Baxter Court in northeast Ann Arbor —a public housing community operated by the Ann Arbor Housing Commission— the gazebo is more than a physical structure, it's a sign that the community cares for them and it's a place to build community in their 23-home neighborhood. 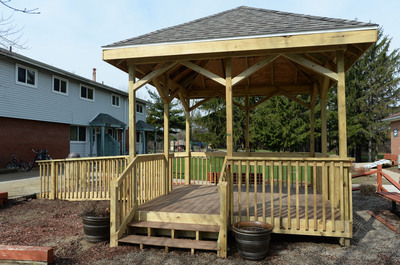 A gazebo at Green Baxter Court built by EMU students. "We find it so hard for us to make our place a nice place, a clean place," said Adriana Ochoa, who has lived in the neighborhood for six years. "The gazebo is so nice. It looks fresh... . it makes us look better." The gazebo was built by EMU construction management professor Jim Stein and a half-dozen of his students. It sits between two rows of townhomes. Nearby is a playground. Residents say they are already planning to buy furniture for the gazebo and planting flowers around it. "It's going to be a great place to sit and help with the sun. Most of us like to sit outside, we like to keep the community looking good," said Kim Pitts, a Green Baxter Court resident. Volunteers work to build the gazebo. Jennifer Hall, director of the housing commission, worked with Stein and his students to identify something they could build. Stein said he got the idea for the gazebo from a resident. The housing commission paid for the materials, which cost about $5,000, and the students donated their time throughout March and April. "I would see them out here every day, even during the snow," Pitts said. Hall called the arrangement a "good marriage." "Funds are limited and there's no way we would have built this without having their volunteer help," she said. Stein is collaborating with the housing commission on another project, which could possibly be a gazebo for another community. He plans to turn the hands-on experience into a class students can take for credit this fall. "A better way to learn construction management is to carry a project all the way through. [Students] get more learning experience," Stein said, adding that the experience and it's impact on residents, "really made an impression on the students." Tue, May 7, 2013 : 5:43 p.m. I saw the gazebo in person and it's just impeccable work. Great job to the students! Mon, May 6, 2013 : 12:09 p.m. I like the final quote from Professor Stein about carrying a project all the way through. I've often thought how such an experience – learning how to manage a project from conception to completion – would be useful no matter what realm you enter in the job world.